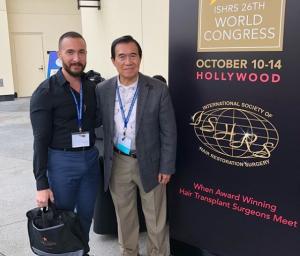 Earlier this month, Dr. Varona attended the ISHRS 26th World Congress in Hollywood. Hosted by the International Society of Hair Restoration Surgery, this annual gathering brings together the world’s top hair restoration surgeons for a full weekend of networking and education. In addition to showcasing the newest treatment techniques and trends, this event plays an important role in helping leading surgeons stay sharp. ISHRS is a leader in providing high-quality education for hair restoration surgeons. Accredited by the Accreditation Council for Continuing Medical Education, the annual conference hosts countless sessions, live demonstrations, exhibits, and other opportunities for continuing education to attendees. As a longtime member of the ISHRS, Dr. Varona regularly attends events and has completed courses through the organization. This year, our Newport Beach surgeon was able to sit back and participate in several advanced sessions and lectures. While a substantial part of the value of these conferences comes from the education portion of the event, there were also great networking opportunities. During the 26th World Congress, Dr. Varona also had the chance to discuss best practices and methods for advancing hair restoration with fellow surgeons from across the world. During these informal settings, our Newport Beach surgeon was able to discuss at length how to best tackle challenging cases with fellow professionals and gain valuable insight into other methods of treatment. Like the lectures and exhibits, topics during these roundtable chats ranged from back-office management to tackling challenging cases of transplant complications and more. As a strong advocate of bringing patients the best care possible, attending high-powered conferences like the 26th World Congress gives Dr. Varona the important opportunity to talk shop with other leaders as well as continue improving his own skill set. Ultimately, this critical information makes an important difference in improving every individual’s experience from consultation to final follow-up. Interested to hear about what sessions Dr. Varona attended at the 26th World Congress? We recommend scheduling a visit to our office to hear more about the event and the new ideas Dr. Varona plans on bringing to patients. Call us at (949) 543-1861 today to get started.